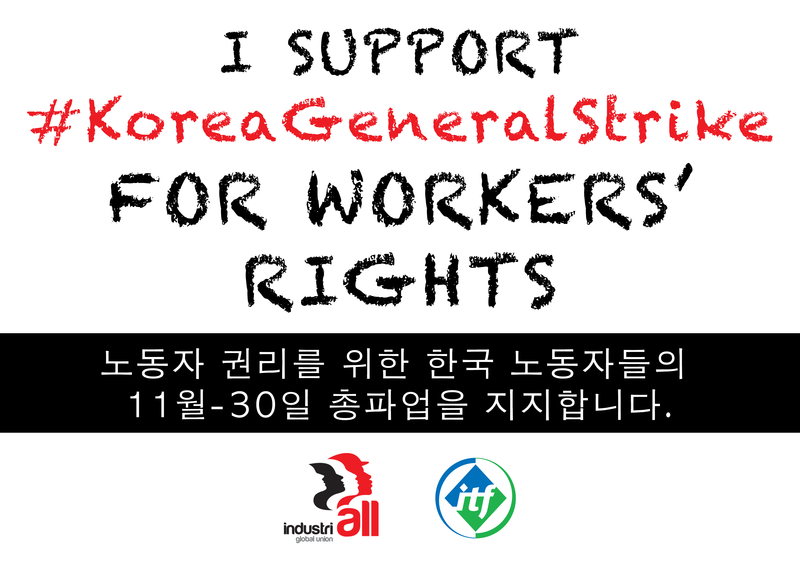 Many ITF unions supported the 30 November general strike in South Korea, calling for the country's President to resign immediately. 220,000 Korean workers took part in the strike. Unions are struggling against severe government crackdowns on labour rights. Rail unions have been on strike since September. The ITF has been intensively involved in supporting its affiliates in Korea and is working with other global union federations on this issue. OUR CAMPAIGN SO FAR: Active protests are being held every Saturday as widespread calls for the resignation of President Park Guen-hye continue. who is currently enmeshed on a cronyism and corruption scandal. On 12 October 2016 there were 11 coordinated embassy actions, ranging from Australia, Netherlands and Norway, to USA, Japan and Thailand – and many, many more solidarity messages and photographs sent in by you. Thank you all. KPTU Trucksol ended its strike on 19 October. Railway workers have been on strike since 27 September however and the ITF is still campaigning to support them. South Korean workers, including the ITF’s railway workers, are staging their largest public sector strike and have been on strike since the end of September.Truckers took industrial action from 10 to 19 October. The unions are fighting back against government plans that would make sackings easier and silence trade unions. The lawful actions are bringing together workers right across the public and public transport sectors. Its show of strength has led to some employers cancelling suspensions, but the government has declared the rail strike illegal. Charges have been pressed against 9 union officers, while 145 officers have been suspended from their job positions in preparation for further disciplinary actions The global union movement will fight these attacks and campaign for rights in Korea and the release of those arrested in the last wave of anti-union repression. For rail and other public service workers, the imposition of a discriminatory performance-related pay and termination system is part of a government attempt to further liberalise and privatise public services. The new system would have workers competing against each other and make it easier to dismiss employees. It would lower wages and undermine both job guarantees and the right of trade unions to defend their members. Truckers are facing the deregulation of the trucking transport market, which will create more competition and force low rates down further. Whilst having reached a settlement on some of their issues, truck drivers are still demanding safe rates and a guarantee of trade union rights. ITF may contact you to get more details about your story.